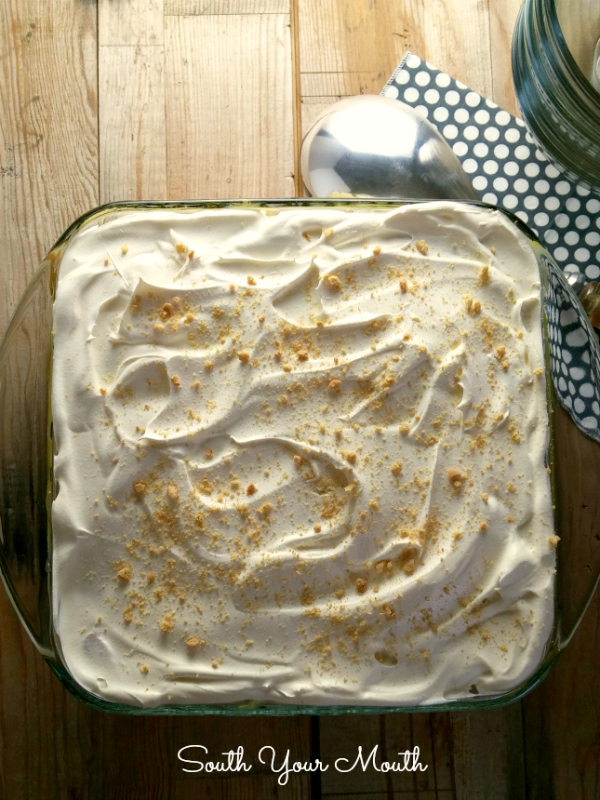 Banana pudding made with Nutter Butter cookies and layers of peanut butter ripples like a peanut butter banana lasagna! I went to college long enough ago that we students actually ate in the cafeteria. We didn't have credit cards for luxuries like McDonald’s and Lean Cuisines. We ate in the cafeteria because it was that, go hungry or spend our beer money on food. As if. Like most school cafeterias circa 1994, the food was pretty bad. We just doused everything in ranch dressing. And I wonder why I gained so much weight in college?? Peanut butter was something else we used to make stuff taste better. We’d slather it on French toast slices and muffins and anything else that had no flavor. My college cafeteria is where I learned how amazing melted peanut butter is. You can stick it in the microwave for a few seconds and instantly have a sweet and salty peanut butter sauce that is amazing on ice cream, cake, pudding, etc. I often melt peanut butter to drizzle over ice cream at home. It just adds a little something extra and makes your kids think you’re a rock star. 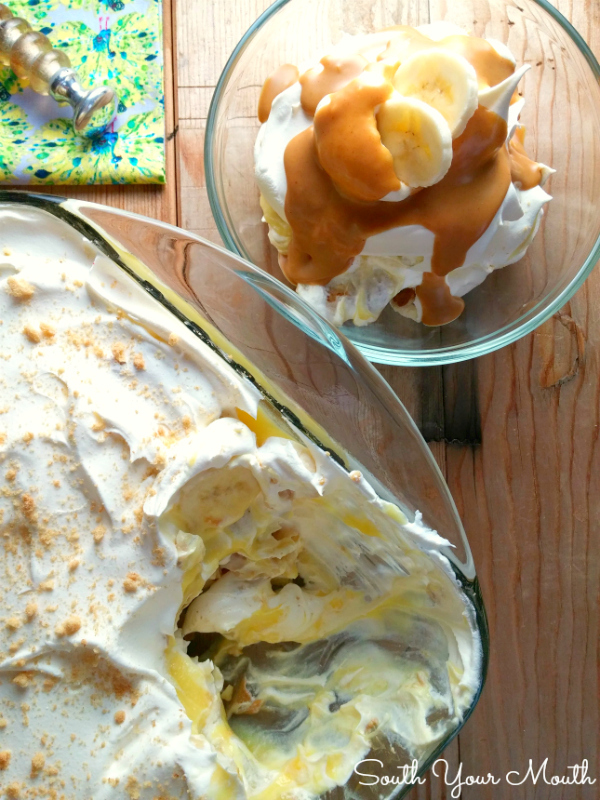 I made Southern Banana Pudding last weekend and ate on it all week. One night I helped myself to some and decided to drizzle some melted peanut butter over because who don’t love peanut butter and bananas?! And it was amazing! I’d been thinking about it all week and decided it was just too good not to create some sort of dessert with that combination! I decided to make sort of a peanut butter banana pudding using Nutter Butter Cookies instead of vanilla wafers. And then I put layers of melted peanut butter in there that made two positively divine peanut butter ripples. Lord, have mercy! Brutus has declared this the best dessert EVER. If you love layered icebox desserts like this, check out a few of these recipes too! Red, White & Blue Cheesecake Salad - This berry cheesecake recipe is the perfect patriotic dessert with strawberries, blueberries and cream cheese filling. Chocolate Nutter Butter Icebox Cake - A chocolate layered dessert with peanut butter cookies, whipped cream and peanut butter drizzle like a chocolate peanut butter lasagna! Strawberry Cream Cheese Icebox Cake - An easy no-bake layered dessert with graham crackers, cheesecake filling and fresh strawberries. Italian Bakeless Cake - A layered dessert with pineapple, vanilla wafers, cool whip, coconut and cherries. 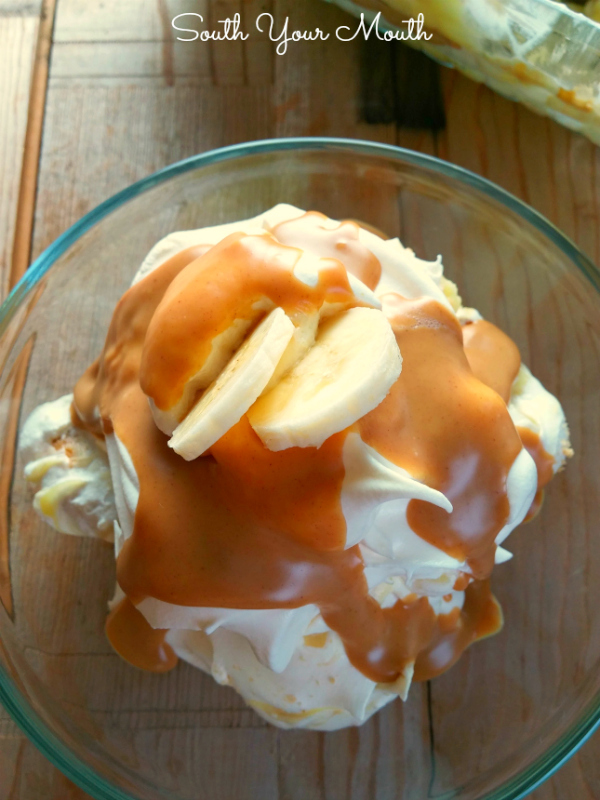 Paula Deen's Banana Pudding - The iconic recipe made with cream cheese and butter shortbread cookies that's Not Yo' Mama's Banana Pudding! Add pudding mix then milk to a medium bowl or stand mixer and beat two minutes; set aside. Heat peanut butter in the microwave for about 45 seconds or until melted and pourable, stirring well after heating; set aside. Arrange cookies in a single layer in the bottom of a square 2-quart dish. Pour half of the pudding on top of the cookies. 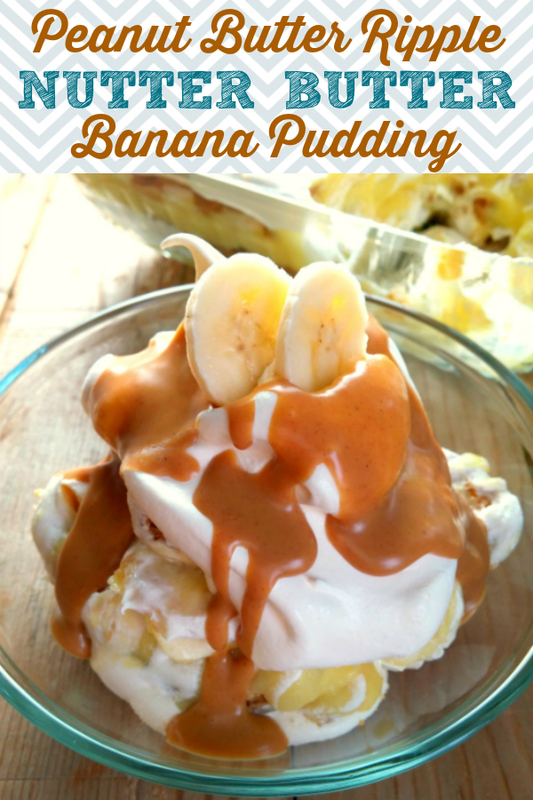 Arrange a single layer of banana slices over the pudding. 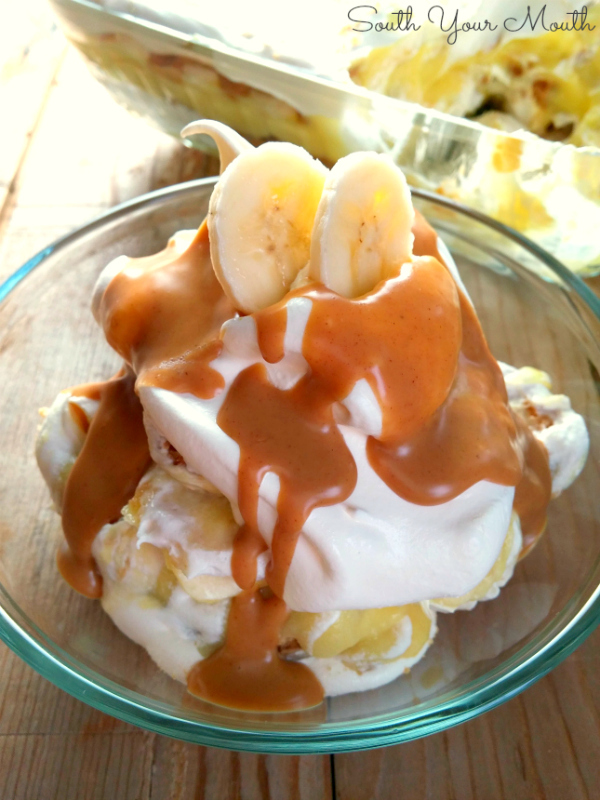 Drizzle half of the peanut butter over bananas. Spread half of the cool whip over peanut butter. Repeat these layers starting with cookies and ending with cool whip. Cover and refrigerate 24 hours or until cookies are soft and cake-like. It takes much longer for nutter butters to soften up than it does vanilla wafers. Garnish with crushed nutter butter cookies. Serve with additional melted peanut butter if desired. *You need good ol’ regular peanut butter for this (Skippy, Peter Pan, Jif, etc. ), not sugar free, all natural, “homemade”, etc. I use Jif. Exclusively, actually. I could be the poster child for Jif I love it so much. I can't imagine why not. I have no idea if nutella melts like peanut butter but I would imagine so. If you live near a Russian store(only place to find these I know) there are wafers that are about 12" across for a common dessert they make which works very well for this. I have made it for a friend that cannot have peanuts. And there are other nut butters available if you want, just use confectioners sugar to smooth out the butter like the Jif. I lasted about an hour, okay fifteen minutes before I dug into this (quality control doncha know) and the crunchiness of the cookies with the other flavors and textures was awesome! I don't comment unless I actually make and taste the recipe and girl I gotta tell you, you are my favorite recipe maker upper in the whole world, keep 'em coming please. I cannot wait to make this! Maybe this weekend. I love me some peanut butter dontcha know! 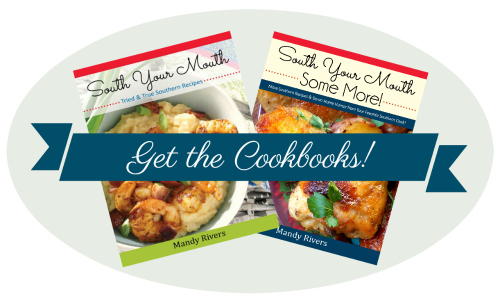 I love your recipes, my husband thinks your shrimp and grits recipe is the best thing I've ever made. Thanks for all the great food ideas. This sounds unbelievably delish!!! I'm going to try it next month for my daughter's engagement party, it's just family and not formal; she'll love it!! In fact, would you have any suggestions for glamming it up a bit, maybe on top? I know good ole comfort desserts are fine at special events, just wondering what I could do to have it look like it's really special. How about putting chocolate shavings on top? Or making a pillow of Cool Whip on top then lining a cookie sheet with parchment lightly coated with butter baking spray, put cookie cutters on top, melt chocolate, pour into cookiec cutters and chill until hardened, arrange on top? Or create a pillow of Cool Whip and sprinkle with a crumb topping, and add a sprinkled layer of grated/copped Reese's peanut butter cups? Hi Mandy! I love your website and recipes! I made this on Saturday and I only have one word.........OH MY GOD! Ok, that was 3. This was so decadent and delicious. No one would guess how easy it is. It made me a very selfish person. My son asked if there was any left last night and I lied. I told him it was gone. He found the pan and called me out! I had to share :). It's too good to share! Pinned it and gonna make it! Looks incredible, I can't wait. I love peanut butter desserts. Jif is the only peanut butter I use too. Thanks for the recipe!